I always tell myself I’ll get to LA to attend the nifty animation evens that are held there with alarming frequency. As my Apatoons friends can attest, I sometimes do–but more often, I’m stuck here in San Francisco. 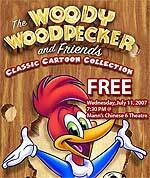 But I’m happy to report that I can attend next week’s tribute to Woody Woodpecker at Grauman’s Chinese Theater, which’ll include appearances by June Foray, Leonard Maltin, Phil Roman, and Billy West, whether or not I actually make it down south. My old friend Gordon Meyer of the Storymakers Studio, which is putting on the event in conjunction with the upcoming Walter Lantz DVD set, reports that it’ll be broadcast on the Web. Neat! Previous Previous post: The Mintz Studio Lives!